I love fall and I will never be over pumpkin spice. I could gorge myself on pumpkin cookies, pumpkin cream cheese, pumpkin bagels, etc. 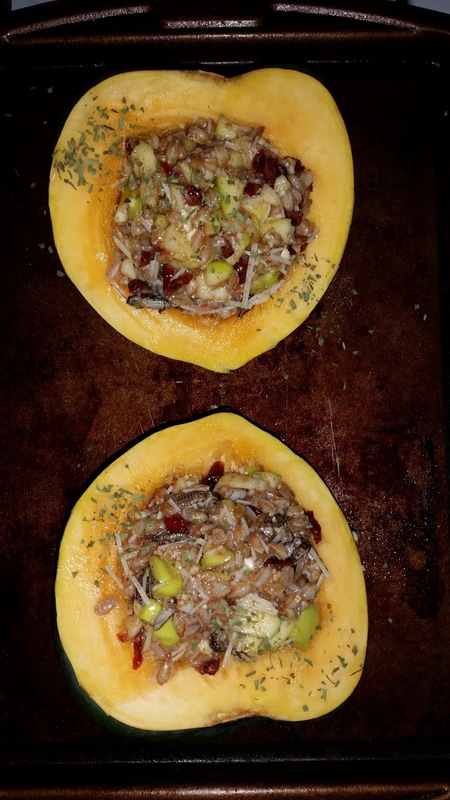 My husband, however, is not so keen on the pumpkin spice world takeover, so I opted not to make stuffed pumpkin and instead decided on acorn squash. HOW COULD YOU NOT WANT TO EAT THIS!? 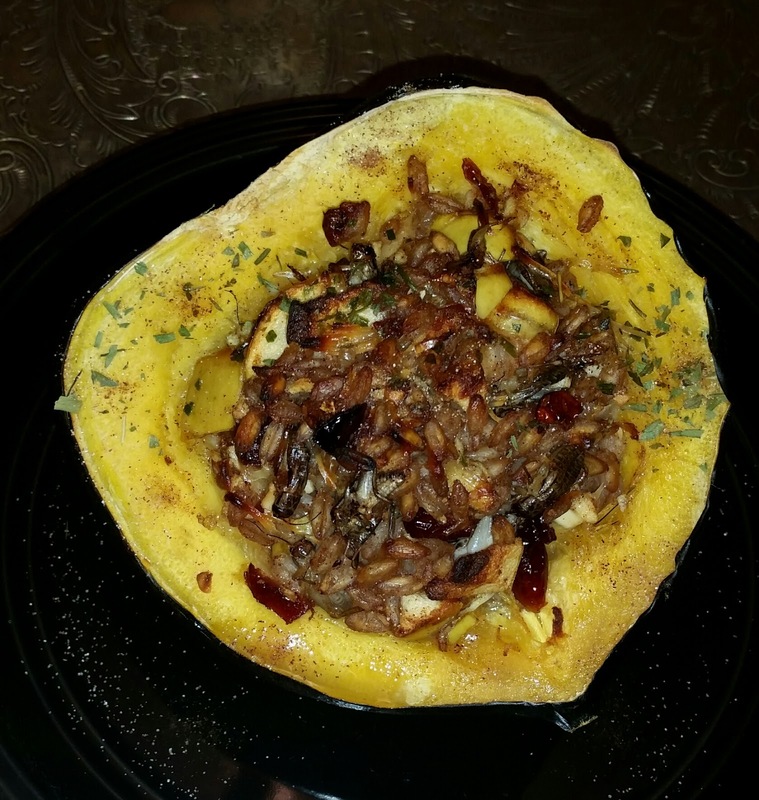 Acorn squash is in season and tastes amazing! I normally just slap on some butter and brown sugar and toss the squashes in the oven, but I wanted to make something a little more hearty and wholesome. So, as I just received 1,000 crickets in the mail, I decided to give them a try! Side note–I didn’t realize there were no safeguards for cricket escapees and many of them got loose in my apartment. My dog was thrilled, but really sucked at helping me catch them. I managed to track six of them down, but it was a feat getting them back into their chirpy abode. Once I took about a third of them out, I closed the box back up and put the other crickets in the freezer. Post freezer, they are MUCH easier to prepare. Just imagine 1,000 crickets trying to get out of a box! It was actually pretty hilarious. Glad I don’t have a squeamish husband! Before doing anything, preheat the oven to 450 degrees and then cut the squash in half–it is tough to do sometimes, but I start with the bottom and work my way down…eventually, it will just split apart. Once the squash is halved, discard the seeds (unless you want to roast them–a great snack! ), rinse the halves out and brush melted butter and a little brown sugar onto each half. Place, cut-side up, onto a baking sheet and place on the center rack. Let the squash cook for 25-30 minutes (it should be fork-tender when you take it out). As the squash is roasting, toss the pearled farrow into a pot of boiling water and boil until tender (about 15 minutes). While the farrow is cooking, chop up the dried cranberries, apple and garlic, and toss (all but the garlic, which you should set aside) into a mixing bowl with the honey, the remainder of the brown sugar, the cinnamon, cardamom, garlic salt (to taste), and parmesan cheese. Once the farrow is done boiling, strain it in a colander and run some cold water over it. After the farrow is strained, put it into the mixing bowl with the other ingredients. 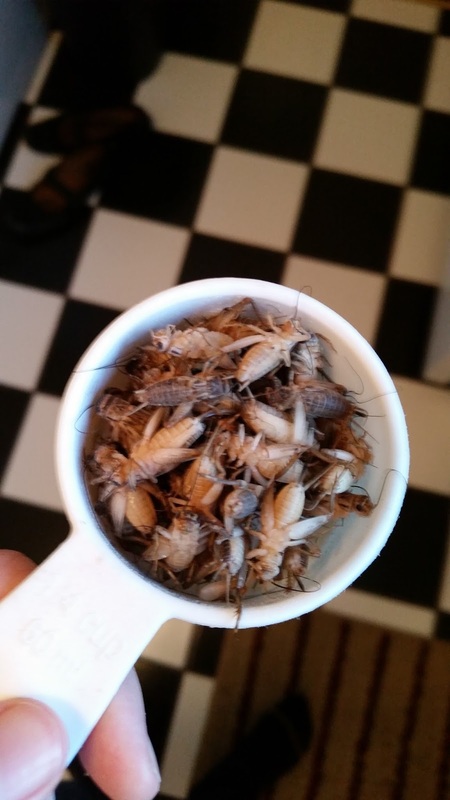 Now, take the crickets out of the freezer (when they thaw, they can get a little mushy, so I leave them in until the very last minute) and toss them into a pot of boiling water. Cook for about five minutes, then strain and toss the chirpies into the mixing bowl as well. Mix up the ingredients and get a sauté pan ready. Put the olive oil in the pan and turn on medium heat. Once the oil is warmed, toss the minced garlic in first and, once the garlic is browned, spoon in the remaining ingredients and let them cook for a couple minutes, stirring occasionally. Once everything looks heated enough, you’re ready to fill the squash with the stuffing! Remove the squash from the oven and spoon in the ingredients. Top with some more parmesan cheese, drizzle with remaining melted butter, and place back into the oven for 20-25 minutes. I garnished with a pinch of tarragon and some cinnamon sugar. Done and done! Enjoy! Previous Post Mealies and Waxies and Chirpies! Oh My! 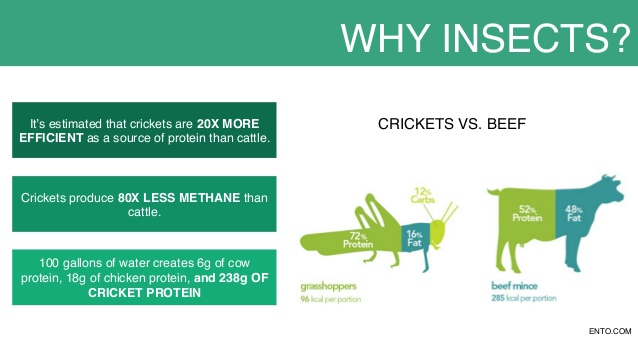 Today is World Edible Insect Day!! Next Post Chirpy Peanut Butter Granola Bars!